MIAMI — After four years of sending monthly shipments of medicine and food for hospitals and needy people in Venezuela, Move Org, a non-profit based in Miami, abruptly stopped three weeks ago. "We stopped because we are seeing that boxes and containers are being opened and searched in Venezuela. We don't want problems," said Hilda Marina Alcalá, the Florida vice-president of the non-profit. Move Org had been sending up to five to seven pallets of donations monthly to help alleviate the burden that the economic and political crisis gripping the South American nation has had on its people. Some of the donations to Move Org that are sitting in a warehouse waiting to be shipped to Venezuela. But recently, the Venezuelan government banned the import of a series of items they deem "war material." 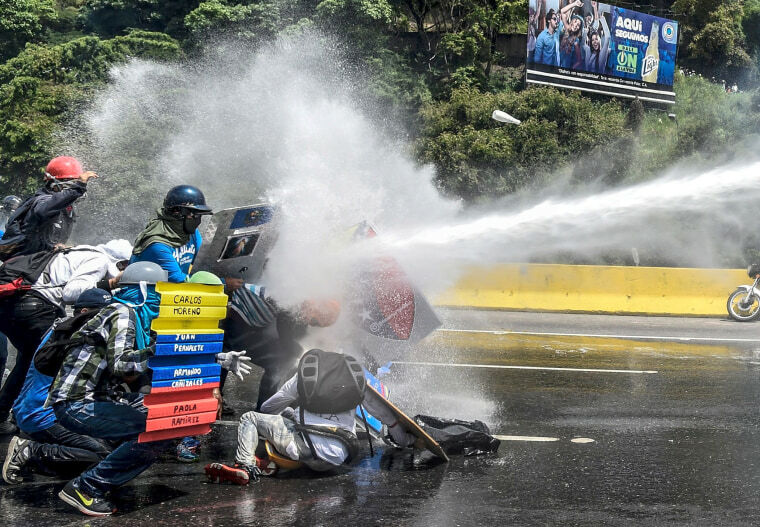 Government officials accuse the opposition in Venezuela of using international courier services to send products to equip protesters in the two months of almost daily clashes with security forces. Some of the products banned are for protection like gas masks helmets, and bulletproof vests. But they have also banned medical products such as first aid kits, eye drops, antacids, gauze, surgical tape, and burn cream, among others. Some organizations that, for years, have been sending donated medicines to Venezuela where shortages are widespread, now find themselves in a bind. Fearing their products will be confiscated, they have temporarily stopped, sending all medical products and food, worsening the situation for those who depend on them. "They have every right to ban material they may consider to be used for 'war.' But how can they ban medicine?" questioned Milagros Ramirez, CEO of the nonprofit, Sanando, which means "healing" in Spanish. She founded the group in Venezuela over ten years ago. She has been living in South Florida for the past two years and has been sending medicine and food for hospitals, orphanages, and nonprofits. Like Move Org, she also stopped the group's weekly shipments to Venezuela three weeks ago. "Everything you can think of is needed in Venezuela," she said. Ramirez said something as simple as denture adhesive is important. "Without it, people who wear dentures cannot eat." Many of the items Sanando sends are now banned. She feels terrible for the children and senior citizens who badly need them. For years, Venezuela's president Nicolas Maduro has rejected international humanitarian aid as the country's economy has plummeted. In a country rich in resources like oil and gold, people are now skipping meals and dying of preventable medical conditions. The United Nations, the U.S., and other countries have requested Maduro to accept aid but he has refused, linking it to potential foreign military intervention. Despite the country's shortages and escalating crisis, Venezuela sees itself as a provider of aid to other nations. In the past, it has provided relief to countries after natural disasters. In March, it sent humanitarian aid to Peru, which had been ravaged by floods and mudslides. After Hurricane Matthew swept through the Caribbean in October, Venezuela sent 20 tons of humanitarian aid to Haiti and 300 tons of supplies to Cuba. Meanwhile, small organizations around the world, particularly in South Florida, which is home to the largest Venezuelan community outside the country, have been discretely sending shipments of medicine and food to assist those who most need it. They usually have volunteers working in Venezuela who are in charge of receiving the shipments and distributing them among doctors, hospitals, nursing homes, and other organizations. Recently with the increasingly violent anti-government protests, Venezuelans outside the country mobilized to gather and send supplies to protesters back home. The supplies included gas masks to protect those protesting from tear gas, heavy gloves to hurl tear gas canisters back at police, and first aid kits for the injured. Fund drives promoted heavily on social media helped individuals collect thousands of dollars to send all kinds of protective material. Some Venezuelans tell NBC News that they think it was the constant posting on social media that caught the attention of the Venezuelan government, prompting them to ban the list of items. "In the euphoria of wanting to help Venezuelans, people did not measure the consequences of making their fund drives go viral," said a Venezuelan activist in Miami who says she has not been able to send food or medicine to her relatives back home. "That was a monumental mistake," according to the activist who did not want her name used for fear of placing her family in danger. Diosdado Cabello, president of the ruling United Socialist Party recently pointed out a popular courier company from Miami, called Liberty Express, and said they are shipping terrorist material to Venezuela. "They are going to be judged according to the anti-terrorism law… they won't come to me and say they didn't know." His brother, José Cabello, who heads Seniat, Venezuela's tax and customs agency, said, referring to the opposition, that "they will not use the ports of our country as a bridge to arm their terrorist groups." Courier services can be found throughout Miami and they are used to send mostly food and medicine back home to relatives. In the midst of the allegations from officials and rumors that boxes are being opened and confiscated, some Venezuelan courier companies have completely stopped shipping food and medicine over an abundance of caution. Some are referring to a video circulated in social media and What'sApp groups that shows opened boxes full of mostly medical supplies. The voice of a man, presumably an official, says they "detected a container full of medical equipment … arriving in support of la guarimba (anti-government protesters)." The video has not been confirmed by NBC News. Maria, who owns a courier company in the suburb of Doral, where Venezuelans are heavily concentrated, said her warehouse is full of boxes containing food and medicine waiting to be shipped to Venezuela. "They are inspecting and confiscating anything that can be associated with protests," said Maria, who did not want to use her last name nor the name of the company for fear of being targeted by Customs. "It's sad," she added. Maria said most of the companies she knows that ship to Venezuela are not sending any food or medicine right now. It's bad for business because the majority of her customers are only sending food and medicine, unlike years past when customers shipped clothing and other merchandise for retail. Because shortages affect most in Venezuela, Maria also fears the possibility that a customs official can inspect a shipment and decide to keep the products because he or she needs them. "Everyone is in need of food. Everyone has the same necessities. And in Venezuela, there is no law." Alcala, the Vice-President of Move Org, says she relies on acquaintances traveling from Miami to Caracas to hand-carry medicines to her mother. At 90, she suffers from Alzheimer and is diabetic. She said tear gas often seeps into her mother's home through cracks in windows and doors. She wants to send her surgical masks to moisten with Maalox in order to protect her from the gas effects. But she says both are banned and hasn't found a way to get them to her. "It's not fair. It's just not fair."